Not much appeals to the senses more than the word “barbecue”. Instantly we think of hot, juicy pieces of pork, beef and chicken, smothered in warm, tangy BBQ sauce. The sights, the smells and the tastes of barbecue are hard to beat. Just writing about it right now has got my mouth watering. 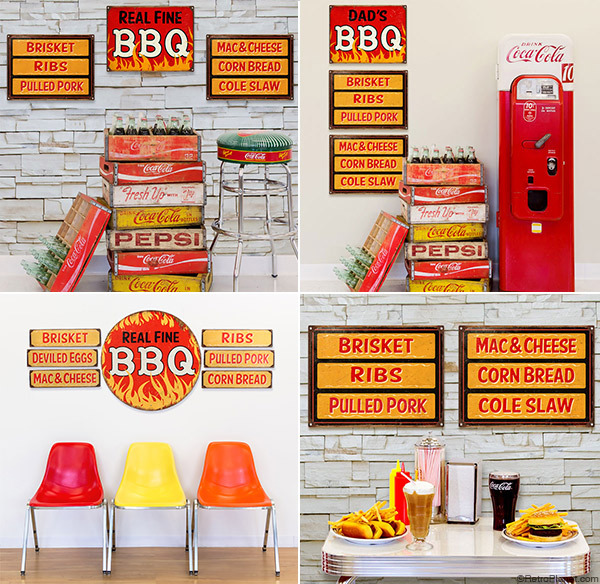 If you’d like to bring some of the tasty awesomeness of barbecue into your home or restaurant, we’d like to help you out by giving you some great ideas on how to decorate with BBQ signs and wall decals. A fun way to hang BBQ metal signs is to hang them somewhat staggered, like we’ve done here. Just as there are many ways to do barbecue throughout the U.S., there are also many ways to arrange metal signs when adding wall decor to a room. We’ve assembled a slew of ideas to help you out, whether you follow our layouts or get some inspiration to come up with your own arrangements. 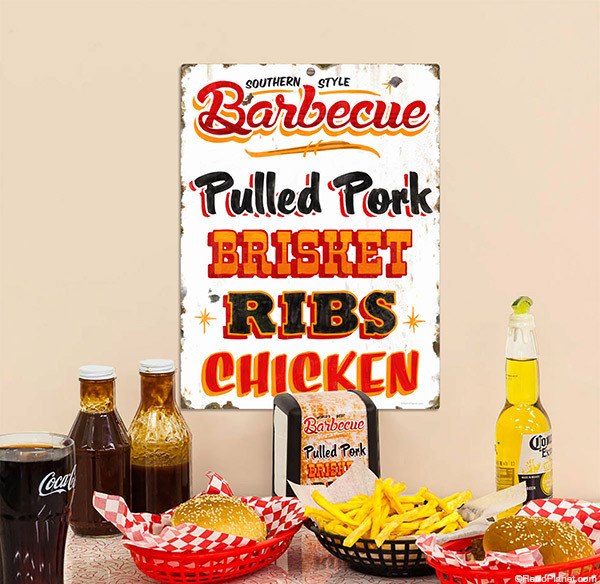 Our barbecue signs are perfect for displaying in your kitchen at home, restaurants, diners and lunchrooms in the workplace. 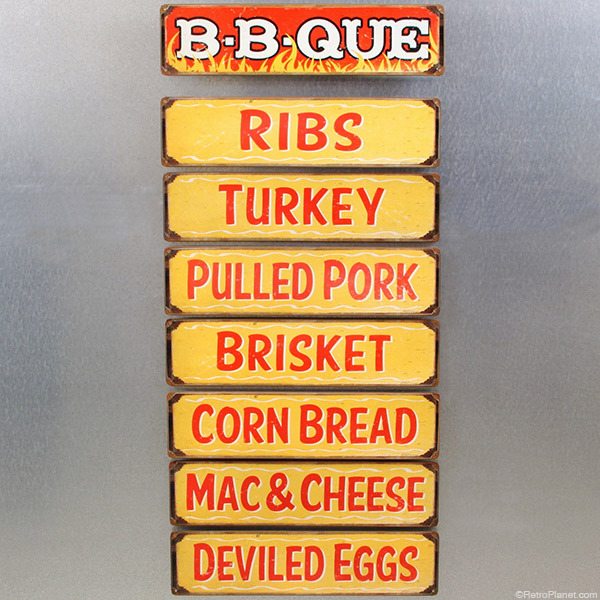 Barbecue signs are the perfect addition to your kitchen or restaurant decor. 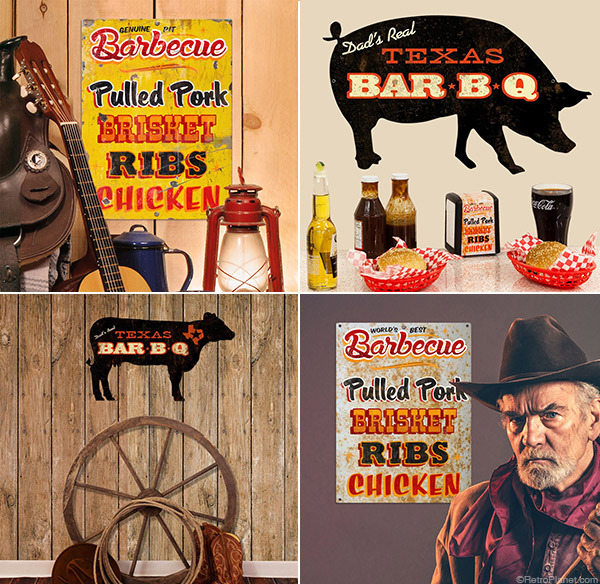 Here you can see just a few of the many options for hanging metal signs all with a barbecue theme. The layout options are nearly endless! In addition to hanging BBQ signs in different ways, it’s fun to display them with vintage items. In this case, we’ve used vintage lanterns, a saddle, cowboy boots and an old wagon wheel. 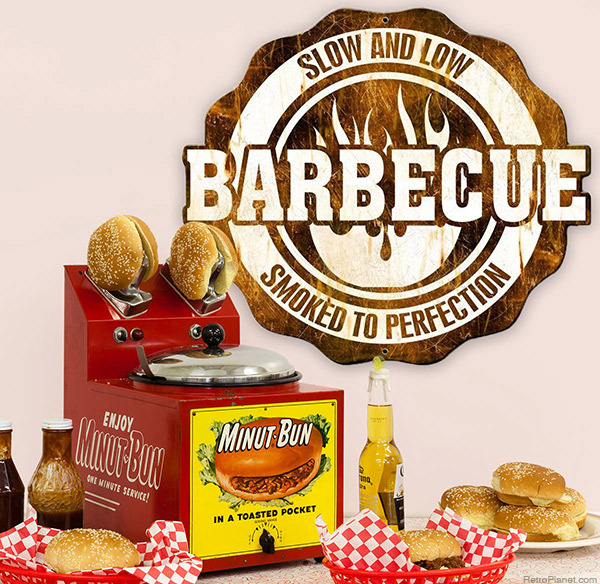 This vintage Minut-Bun machine is the perfect companion to our 26-inch Slow and Low Barbecue Sign. 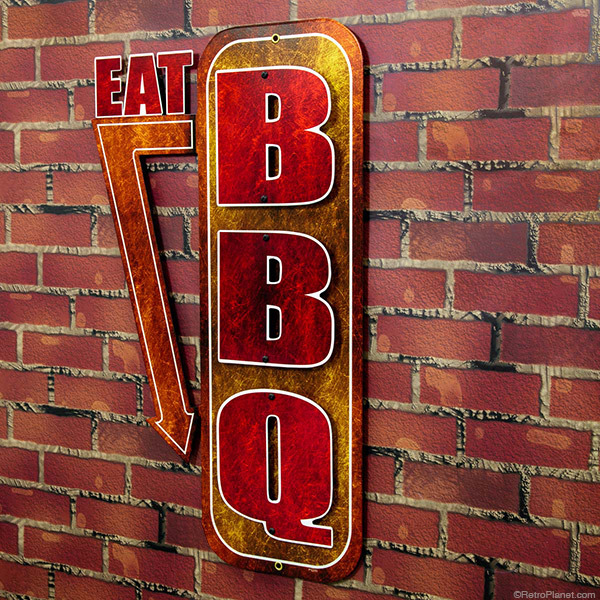 Cool backgrounds like this imitation brick background bring more interest to an already great-looking BBQ sign. Our BBQ signs can be hung on any sheet metal, too. All you need is a set of heavy-duty magnets (SKU #37896). 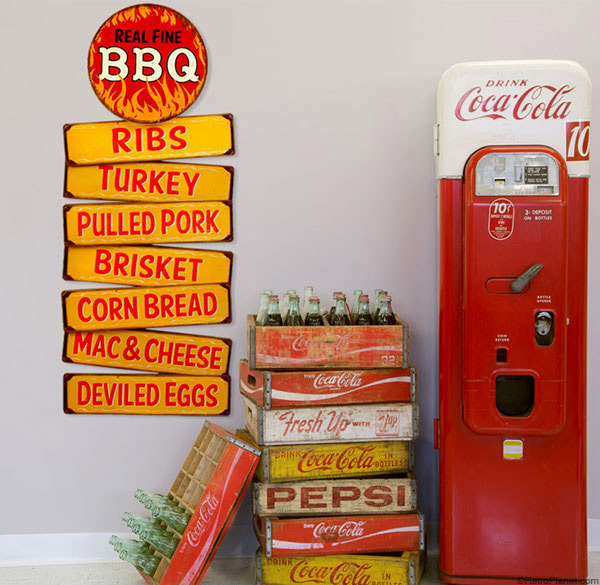 Some of the barbecue sign designs you see here are also available as wall decals.